Vancouver Working Peers as we meet as part of the SW CHAPS Network! 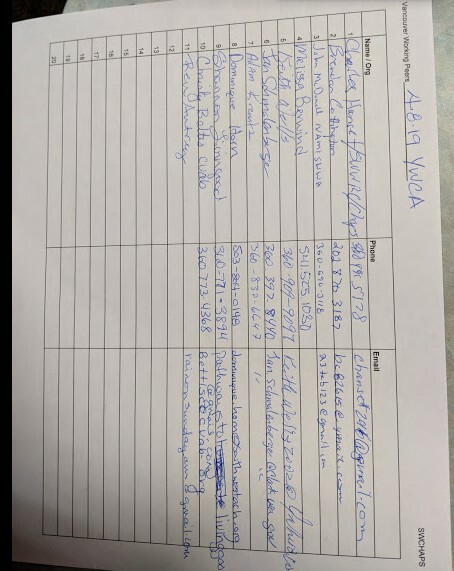 Photo of April 8 2019 Vancouver Working Peers Meeting at Safe Choice / YWCA Clark County. to learn more about the SafeChoice program resources. Nichole Peppers, Assistant Director of SafeChoice welcomed us to an awesome meeting room where we first learned some of the 102 years of history for the YWCA in Clark County as it started as a lunch counter for working women downtown. But since that time it has grown into a wonderful resource for all of Southwest Washington with the SafeChoice program that helps people navigating domestic violence situations. "The SafeChoice Program advocates for, educates, and supports those affected by domestic violence and has been providing domestic violence services to Clark County since 1974. In addition to operating the only domestic violence shelter serving Clark County, SafeChoice offers a wide array of services such as one on one advocacy, classes, support groups, a 24 hour hotline and legal advocacy. Domestic violence can happen to anyone, regardless of age, educational background, income level, religion, ethnicity, and sexual and gender identity. Domestic violence is abusive behavior used to gain power and control over an intimate partner. Abuse takes many forms; it can be physical, emotional, sexual, or financial. It is a learned behavior, and is not caused by anger, drugs or alcohol, or stress. The SafeChoice Program empowers survivors by providing information, resources, and support to increase safety and foster healing. We collaborate with community partners to offer resources that are survivor-centered, providing participants tools to change their lives and heal. SafeChoice services are free and confidential and inclusive and accessible. Domestic violence impacts our entire community, community education and prevention is a vital part ending domestic violence. Click here to learn more information about our outreach or prevention activities or you can learn more about ways to volunteer here. A printable PDF of all SafeChoice services is available here. For more information about any of their services, please call YWCA Clark County at 360-696-0167, and they do accept collect calls.